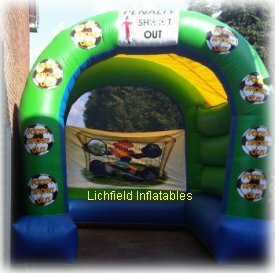 We have these Penalty Shootout Inflatables in both small and large sizes. 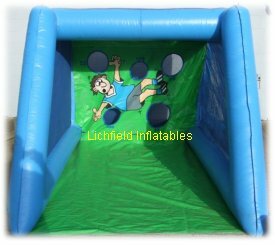 Great fun for children and adults alike and a sure hit for fun days and fayres. A variation on these Penalty Shootouts is the Football Speed Cage where the speed of the shot is registered on a radar as the ball enters the inflatable. 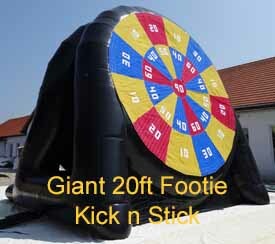 If you're looking for a huge centre piece football game then our giant Kick n Stick game could be the answer. This giant 20ft diameter game is a cross between a penalty shoot and giant darts with participants trying to score the highest total they can with three balls. You'll need a minimum operating area of 50x50x25ft for this huge attraction which is supplied staffed as standard. If you have any queries, questions, or would like to hire either of the Penalty Shootout Inflatables or the Giant Kick n Stick please call us on the number below or click to enquire and we will do all we can to help.